ed with yellow pine trees growing free of underbrush. He stated that the hills surrounding the Youghiogheny Glades were either bare or covered with a sparse growth of white oak. The day before Shriver studied the area of Deep Creek, beginning near Hoop Pole Ridge, a heavy rainfall had flooded the glade. He noted that residents of the area stated that spring thaws usually covered the flat ground near Deep Creek, producing a large lake. James Shriver—together with Captain McNeil, Andrew Stewart, and John McHenry—joined Calhoun and his party when they examined the glades area in August 1824. The party camped in the Deep Creek Glades for ten days and studied the terrain with the hope of devising a canal-lock system on both sides of Backbone Mountain. After the Civil War Hiram Tasker predicted that the Glades would eventually become a lake. Some geologists believe that they were lake bottoms in the Glacial period. If these scientists are right, man has returned the area to a former condition instead of hastening the geological processes foreseen by Tasker. The area actually became a lake about thirty-two years ago. The Pennsylvania Electric Company acquired the land to carry out its project of storing hydro-electric power for Johnstown, Pennsylvania. Purchases were supervised by August Weis, assisted by O. E. Pursel. F. R. Corliss and Scott Anderson. Title searches were made by Fred A. Thayer, of Oakland, who also assisted in other legal matters. Actual construction did not begin until about three years after the land had been acquired. F. R. Corliss was in charge of a three year survey and engineering investigation which resulted in specific plans for the project. 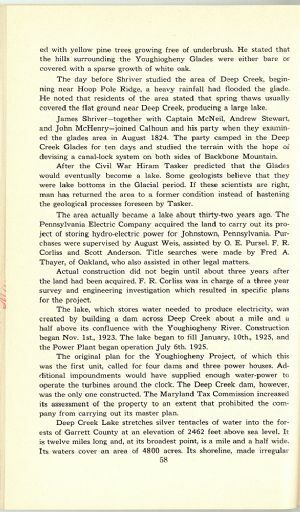 The lake, which stores water needed to produce electricity, was created by building a dam across Deep Creek about a mile and a half above its confluence with the Youghiogheny River. Construction began Nov. 1st, 1923. The lake began to fill January, 10th., 1925, and the Power Plant began operation July 6th. 1925. The original plan for the Youghiogheny Project, of which this was the first unit, called for four dams and three power houses. Additional impoundments would have supplied enough water-power to operate the turbines around the clock. The Deep Creek dam, however, was the only one constructed. The Maryland Tax Commission increased its assessment of the property to an extent that prohibited the company from carrying out its master plan.